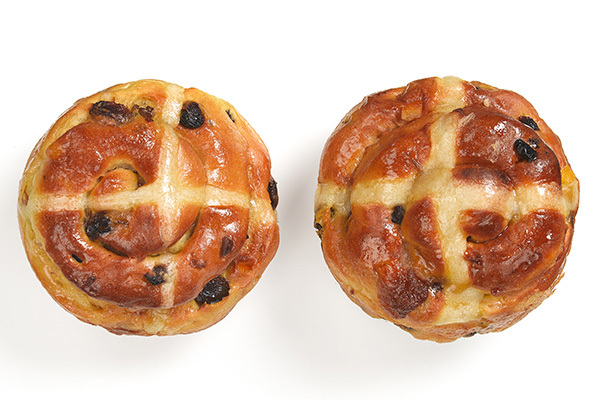 This Easter, we are very excited to introduce one of our latest products in the Heston from Waitrose range – “Simnel Inspired Hot Cross Buns”. Travelling back in time, we’ve taken inspiration from a medieval treat for this year’s version of the Easter staple. We’re very proud of the fact that hot cross buns have been in the range since its inception 7 years ago. Every couple of years, we try to launch something that is not only delicious but also has a clear point of difference, like the Earl Grey and Mandarin Hot Cross Buns and the Ginger and Acacia Honey Hot Cross Buns, both of which were a big hit. This year’s version not only tastes different, it looks different too – two classic Easter treats swirled into one Simnel-inspired hot cross bun, scented with orange and packed with vine fruits, marzipan pieces and nibbed almonds. Through the years, we have worked hard with the fantastic food- development and food-technology teams at Waitrose, as well as with the teams in the factories, to ensure we have something that not only tastes good but also has an incredibly light texture. Hot cross buns are proving as popular as ever. This year’s product rounds up what we consider to be one of our strongest offerings of Easter products.